CONCORD, NC – We are pleased to announce the highly anticipated talk show hosted by NASCAR driver and TV personality Chris Lafferty has been given the green light to resume filming. "The Last Lap with Chris Lafferty" is an energetic uncensored talk show with a racing theme. With good music and a variety show feel, Chris Lafferty brings some of the biggest names in racing as guests to see a side of them that you've never seen! Guests appearing in past episodes have included Carl Long, Rick Crawford, Ron Hornaday, and more. For more information on the show along with previews, be sure to visit www.laffertymotorsports.net/the-last-lap-with-chris-lafferty. This show is filmed in front of a live audience. 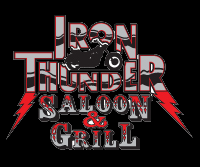 Come join us Friday, May 25th at the Iron Thunder Saloon & Grill (a stones throw from Charlotte Motor Speedway!) for this great event! Special guests will include Don Miller, former Penske Racing President, and motorsports artist Sam Bass! Seats will fill fast and the show begins at 8 p.m.
Iron Thunder is located at 10023 Weddington Road, Concord, NC 28027.